Modern microprocessor based electronic fuel injection allows you a level of control not possible with carburetors. With that sophistication comes the responsibility to make hundreds upon hundreds of decisions that have to be programmed into your ECU with little or no guidance from the fuel injection manufacturer. After market efi suppliers have handled this in a number of ways. Pictured above are our first generation (left) and our second generation ecus (right). These are still through-hole components for reliability. It's getting tougher to do through hole parts, but they are more reliable. How EFI Systems are sold : "Installation Centers"
One way is to set up dealers or distributors who do the installations or sell the products. These "centers" undergo a brief factory course and then assume the burden of dealing with the customer, who certainly knows less than they do, at least at the start of any project. The reason the manufacturers set up these centers is twofold: First, each center has a minimum "buy-in", so the manufacturer sells more parts; Secondly, the manufacturer does not want to deal with the customer and hold his hand during some lengthy tuning process. This system works after a fashion, but in reality nothing really gets properly calibrated and turns into a situation that the manufacturer washes his hands from. You have constant battles because in as much as every project is different, the ecu calibrations tend to be hand-me-downs from earlier projects that the installer/center attempts to modify for the next project. Guess what, lots of things never get rescaled or adjusted, and like passing deficient genes to the next double helix the errors go on and on. The base problem is that nothing is ever really written completely from scratch and also no one involved is an O.E.M. level power train engineer. How EFI Systems are sold : "High-End"
Another way to deal with the after market efi dilemma is to sell only $4,000.00 to $8,000.00 ecus that will only be sold if a specialist is paid to do a custom wiring harness at $2,000.00 to $3,000.00. Also, the installer who comes to you has to be reimbursed for travel and a per diem of $1,500.00 per day, or $100.00 per hour locally, and he comes with a catalog of programs in his laptop that have been generated by the efi manufacturer. This individual will "load" your ecu and then depart. The efi manufacturer may or may not sell you software and programming tools depending on their business practices. If you have a very expensive race vehicle or a multimillion dollar offshore racer this is not a bad way to go because you are the high-end target customer. You are assumed to be either unknowledgeable, or smart enough to pay for expertise and are charged for this. You get gold plated connectors and gold plated prices. This is the most sophisticated solution. Think Bosch Motorsports or Cosworth. How EFI Systems are sold : "Low-End"
A small number of after market firms will sell you fuel injection systems and some method to adjust them, but unlike the two categories above you are on your own. They make claims to being "simple...or calibrate in one hour..etc.". Unfortunately nothing is simple and the possibility of getting your data tables or parameters in your ecu correct given that fuel injectors, fuel pressure, engine parameters are all unique to a particular situation is next to nil. Assuming you have 500 points to adjust for all the various inputs and that each input may have 255 possible entries, your odds of getting all this correct are worse than winning the lottery. Don't believe the claims of ease of use, this is just self delusion. It takes a group of Detroit level power train engineers up to three years to generate ecu calibrations for new power plants. They have to do simulation, actual dyno work on both transient and other types of dynos, as well as real world testing in every imaginable condition. If you think you can achieve this in one hour there is a well-paying job waiting for you in Japan, Germany and the USA. In case you are really confident we might tell you that some oem ecus have 15,000 programmable issues. RB Racing's RSR Fuel Injection Systems take a different approach to getting you on the road and providing you the tools to calibrate you ecu youself...without the need for some ill-trained installation center nor the need for a high-priced expert with an attitude. We put the power in our Autocal Software so all of our customers, no matter where they are, will all be starting at the proper point for their particular project. Simply by entering basic data in 15 categories, most of which are "givens", or simply by pushing generic macro buttons that burp out complex, custom fuel distribution curves , you can generate a workable complete ecu calibration tailored for your specific combination of injectors, fuel pressure, horsepower etc in just a few minutes. The vehicle will start, idle and deliver the exact amount of fuel, expressed in horsepower that you entered. There are no milliseconds to deal with and no cryptic "time on gammas" and the like to confuse you. If you understand horsepower and torque curves, and that's the way most of us think, you can be running in short order. No other system in the world can do this. We have literally written a calibration, gone to the line and set a world speed record with zero testing. Of course it takes about 25 years of tuning and 5Mb of software that took over 2500 man hours to write to do this.You still have to fine tune afterwards but the software does this for you by making sweeping changes based on your real world observations. There is no "point editing" if you know what that means. Point editing is far far too difficult. For you hunt and peck types we include a point edit program free of charge that allows you to point edit any point in the ecu on the fly as well as offline. 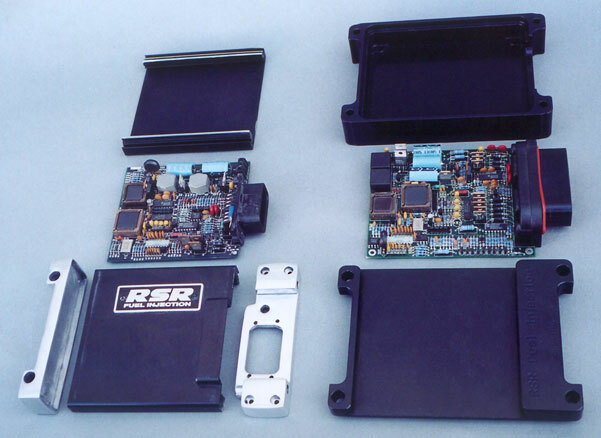 Your RSR ECU is speed-density based. It is not a speed/throttle angle or "N-Alpha"system. This means it looks at manifold pressure and engine speed to determine how much fuel to deliver to your engine. You get to enter data, edit data, look at data, or whatever, in a 16 x 16 matrix (256 sites) we call a "fuel map". This fuel map can be scaled five different ways: 1/2 Bar, 3/4 Bar, 1 Bar, 2 Bar,or 3 Bar. This allows you to scale your fuel map to match your engine's vacuum or boost parameters. In addition you have inputs for eleven other parameters relating to engine temperature, inlet air temperature, acceleration functions, throttle angle, idle speed control, and the Oxygen sensor. Contained in the RSR ECU is a separate, stand-alone, barometric pressure sensor (altimeter) that compensates for elevation changes. It takes 26 to 40 input/output wires to accomplish this which we think is the minimum to do the job. All wiring and connectors are waterproof. Not with our ecu because it does not control ignition timing. 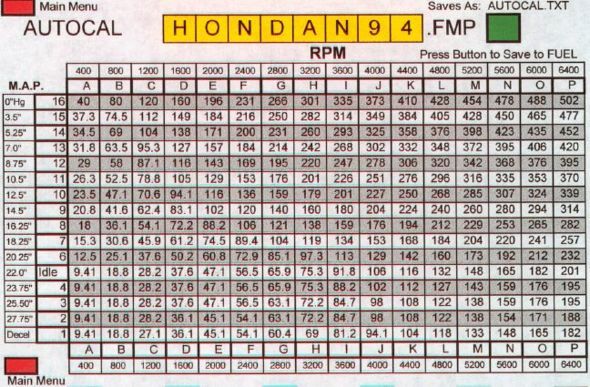 If you think fuel map programming is difficult just try to program your ignition curve. This presumes you know more than the factory, which is doubtful. It also presumes you have some way of evaluating your changes which is even more doubtful. In-cylinder pressure transducer equipment, sensors and software runs well into the $100,000.00 range and properly equipped dyno cells with climate control can cost a million dollars or more. It is best you go with stock timing and then venture off into the various after market solutions if you just have to fiddle with it. We have seen nothing but trouble in this area and are sick and tired of people telling us they are going to kick their timing this way and that and they've never had a lick of training. Timing is a very tough business to play with and most people use it as a band-aid to cover poor engineering of other components...e.g. lots of boost, poor fuel control and no intercooler. You have a lot of things to worry about when you play engineer and this should be the last item on your list. Remember, proper scientific method is to alter one thing at a time and eliminate the variables. Adding ignition timing to the fray exponentially increases your problems. A modern Formula One V-10 at 18,000 rpms runs about 50 degrees of spark lead...the question is... would you have known this in advance, or known the reason why. Think about it. Over 15 years of testing. More than one million miles with zero failures. Mil-Spec components, fully encapsulated, waterproof connectors, high temp fuel resistant wiring, genuine Bosch, Delphi, Visteon, Deutsch, Packard, and AMP components. ECU can be "hard" mounted through the aluminum machined end caps without stressing the ecu enclosure which is hard anodized. Condensation, rain, vibration (they are Harley-proof), car washes, gunk sprays, salt exposure, won't kill the electronics or the wiring. RSR fuel injections have been successfully used in cars, trucks, boats, and motorcycles. We do not fuel inject things that fly because sooner or later one of them falls out of the sky. At least in a land based vehicle you can park or coast to stop if you have a problem. No planes, no ultra lights, and don't tell us that motorcycle engine is going in a boat because we won't believe you.